Things really picked up the pace today, for real. From my experience with modeling instruction in physics, I was waiting for a day like today. It was filled with two labs, scholarly article review, whiteboard debriefs of labs, discussion of proportional reasoning, and whiteboarding homeworks. I've been taking photos of boards and happenings in class and posting them, not to mention copious live-tweeting during the workshop of all the good stuff I can type into 140 characters! 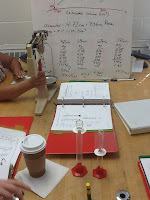 We set out in the lab where we were comparing the measured volume (mL) of water in a container of regular shape to the calculated volume (cubic-cm.) 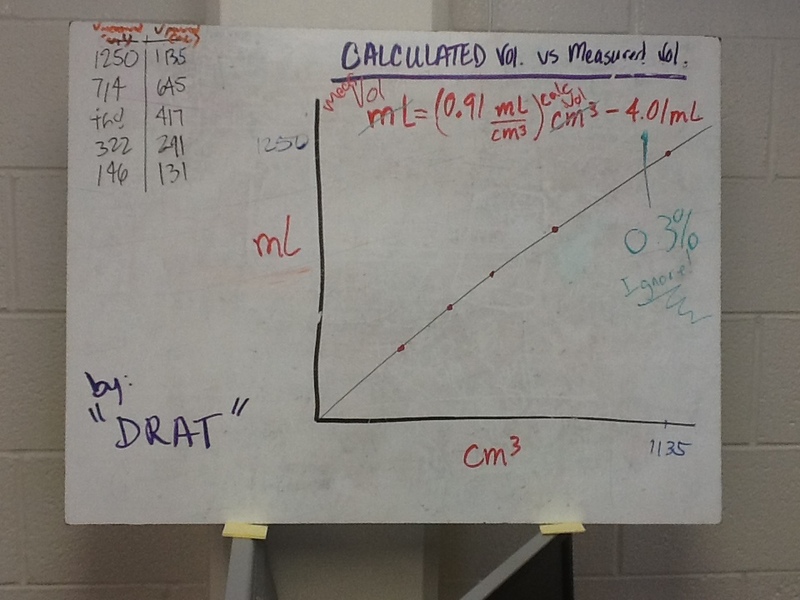 The four lab groups each took five data points for the water volume and plotted their measured volume vs. calculated volume on a whiteboard, determined the slope of their line of best-fit and derived a mathematical model to represent the relationship between the two volumes. 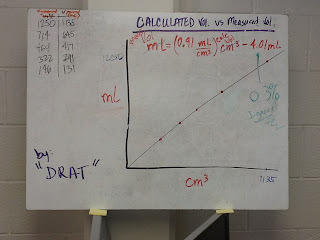 Through whiteboard debriefing of the lab, the class (in student-mode, of course) arrived at the relationship between volume units of milliliters and cubic centimeters. To many untrained eyes, this relationship might seem trivial and about a three-second direct instructional accomplishment; however, the beauty of the modeling cycle to arrive at this relationship achieved so much more than just a mere fact (that of the unit relationship) that could never be obtained through traditional instructional methods. In the modeling cycle students achieve a number of additional learning outcomes that are of varying depths. In the lab we did on water volume, several things arose organically out of our experimental process and data interpretation. For example, uncertainty in measurement, lab error, precision and accuracy, significant figures, plotting data, taking measurements with lab instruments, how to find a physical meaning of a slope on a graph, presenting findings to others, discussing experimental findings to arrive at consensus, and how to write an equation for a physical relationship (not a simple algebraic y = mx + b.) All of these points are secondary learning outcomes that arise from the way the instruction takes place. Traditionally, each of these points would be treated separately in varying degree without much context and only to be taken for the word of the teacher as fact. When students arrive at these secondary learning outcomes it is out of necessity. That means, significant figures becomes...meaningful to them! All of the secondary outcomes become meaningful since they were first experienced in an authentic context, the experiment. How cool is that!? The Chemical Bond - Atoms are held together in molecules and crystals by electrostatic forces. Molecular Shape and Geometry - Atoms and molecules are held together in molecules and crystals in well-defined geometric arrangements. The Kinetic Theory - Atoms and molecules are always moving. The Chemical Reaction - Atoms in molecules and crystals can be rearranged to form new molecules and crystals. Energy and Entropy - The extent to which physical changes and chemical reactions proceed is controlled by accompanying energy and entropy changes. After a short break to set up for the next lab, we were right back into student-mode investigating the relationship between mass and volume. Any guesses where this is going? This lab put us into a situation where we had to problem solve how to find the mass and volume of these small metal cylinders that were not quite regular cylinders. With the help of water displacement and a triple-beam balance (who uses those anymore anyway!?) and some coffee, we were able to find the mass and volume of these little metal pieces to compare. And compare we did...as a class! 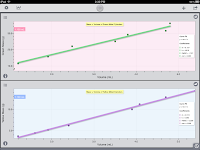 Each group compiled their data into one large set and every group then used LoggerPro (an essential piece of software for any science classroom) to graph the data and derive a mathematical model (equation) for the relationship. 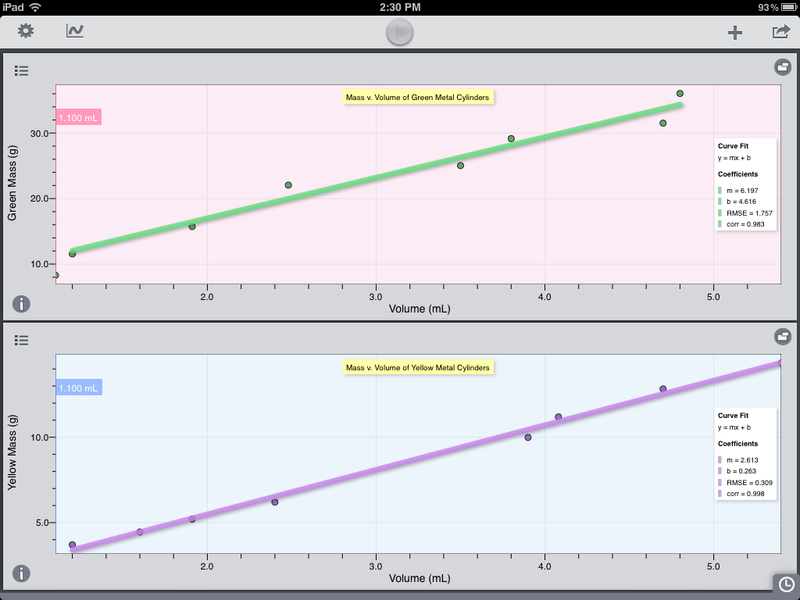 I chose to try out the new Graphical Analysis app for iPad on this one and see how plotting the data might work. It worked really well! 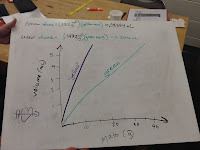 We whiteboarded our data, derived an equation, and presented our data to the class. Funny thing is, the teacher didn't tell us which axis should have which measurement; so, we got different answers--ruh roh! Through class discussion, we were able to arrive at consensus, determine the physical meaning of the slope of our curve to be density, and use our particle model to explain what we saw. The particle model pervades the subsequent units as each model builds on the previous model. 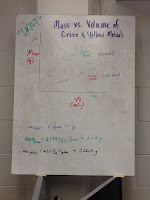 Our whiteboards came in two flavors: graphs of density, and graphs of specific volume. After we used lab data and a graph to arrive at consensus about a density model, it was on to deploying our model on some homework problems. I love density as a concept and love teaching desnity to my students. I was really excited with how this played out and saw how it would fit in with my own previous approach. In groups, we worked on homework problems and then each group was assigned two of the eight problems to whiteboard and present. The student-mode of all the participants in the workshop really came alive in the homework whiteboarding, because they all embedded student-like mistakes into their solutions and explanations. Through discussion, students convinced students of what the correct way to approach a problem would be based on our current model. The day ended by pre-lab planning for a density of a gas lab we will do tomorrow and our traditional end-of-the-day debrief. The debrief was great. We discussed things like how to pace lessons and labs and how to help students transfer their mathematical knowledge to the science context. Our workshop leader did an awesome job addressing all the questions. We talked at-length about proportional reasoning and how to strengthen that in students who aren't already strong with the skill. We examined our whiteboarding techniques and asked questions about how it might work with high school students. I noticed that we, as a group, are still getting used to being students in this workshop. It is difficult for teachers to get out of their 'teaching mode' and become learners, in the genuine sense. We tend toward offering our own expertise, personal commentaries and anecdotes, because that's what we are used to doing; however, we need to discuss what is at hand, learn from the workshop leader, and embrace modeling. After all, nobody likes a know-it-all. 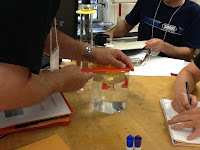 Today's workshop activities really elucidated the nature of the modeling instruction pedagogy for everyone. There is no more 'sage on the stage' in this teaching, only 'guide by the side.' I really think that modeling instruction makes you the Mr. Miyagi of science teaching, and teachers can learn a lot from the way he taught Daniel-san. Productive and constructive event is going to be held. This site is well managed. Al the points are covered. This is the modler’s blog day 2 and get info from mycustomessay to get educational task. The material used is quite fresh and all the things are well described.